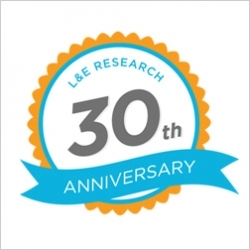 L&E Research, a Raleigh, NC-based business founded in 1984, is celebrating its 30th anniversary this year. Started by Lynne and Ed Eggers in 1984 as a two-person, home-based business, L&E has grown to become one of the largest fieldwork firms in the U.S., operating eight focus group facilities in seven cities. After 20 successful years, the Eggers stepped down in 2004 when Brett Watkins, formerly with Management Research and Planning Corp., took over as President. In the years since, L&E has exploded, opening new focus group facilities in Tampa in 2010; Charlotte and St. Louis in 2013; and Cincinnati, Baltimore and Columbus (OH) in 2014. This growth resulted in L&E Research being named to the 2014 Inc. 5000 list. L&E Research provides focus group facilities and services in mid-major markets in the Southeast and Midwest, offering a diverse alternative to the over-researched major markets. L&E Research connects clients with customers, consumers, medical professionals, patients, business professionals, and more – for virtually any market research project. They make efficient and accurate connections through the ongoing development of L&E’s software and technology solutions.